So this year, I decided to play around a little bit with a way to wrap a gift card and a treat all into one! 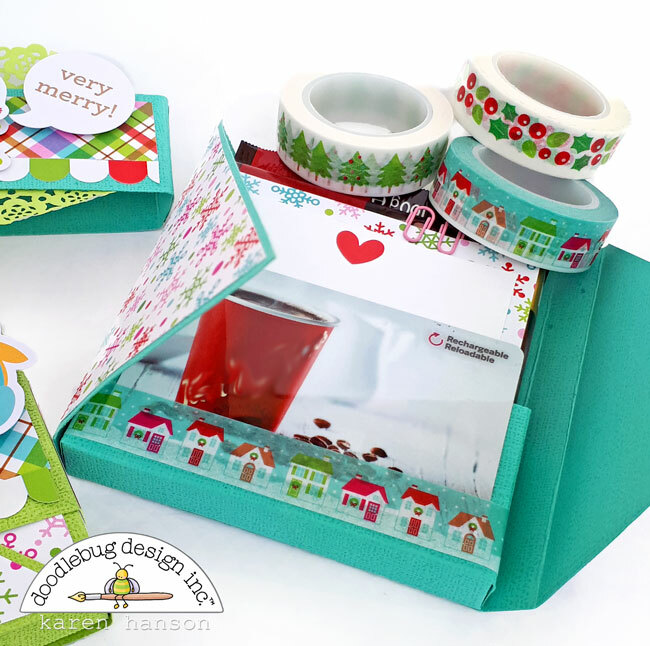 With the help of Doodlebug's adorable Christmas Town collection, I present the gift card/treat wrap (original title, I know)! I am really happy with how these turned out! The base was simply created with some textured cardstock, with pieces of patterned paper from the 12x12 collection layered on top. On top of the base is a little 1.5" wide sleeve that was also created with the textured cardstock, topped off with coordinating patterned paper and then a cute border sticker from the 12x12 This and That sticker sheet. I then used some cute characters from the Odds and Ends pack and a little sentiment from the; Chit Chat pack. And when you slip the little sleeve off, it opens up to reveal... ...drum roll please... ...the gift card and treat (I know, I bet you guessed that)! A simple little pocket holds the chocolate bar in place, complete with a simple tag that my daughters can use to write a message. Oh, and I have a little bit of quick tip for you - if you are throwing a gift card into a card at the last minute (because hey, we have all been there), use a little washi tape to hold it in place! Not only does it save the card from falling out without the hassle of creating a little pocket, it is oh, so cute! 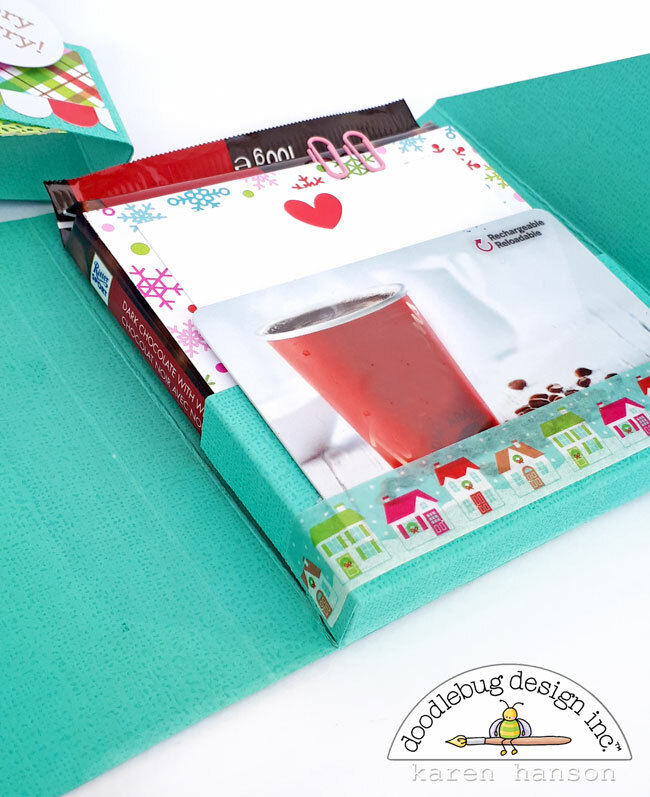 For this project, the washi tape (called Tiny Town) was an easy way to feature the gift card without creating more bulk with another pocket. 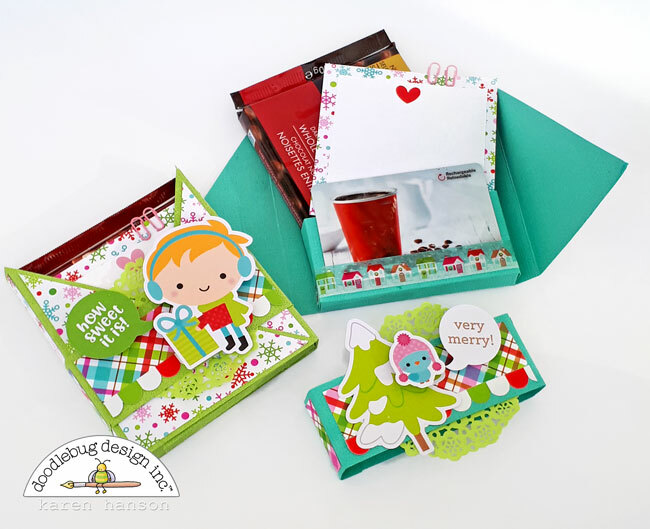 So there you have it - a couple of useful gift cards with a bit of extra Doodlebug cuteness and a yummy treat to get the teachers through that last day with the students before the break! I have a feeling that I will be making a few more of these for the holidays! These little gift pockets are precious!! Such a cute idea!! These are darling. Do you have instructions? Thank you. Karen, it was a bit of a "creation on the fly" type of project, but let me see if I can put some instructions together for you! Give me a couple of days and I will have something for you! I actually just measured around my chocolate bar and created as a I went. Let me see if I can pull together some details for you to recreate them! Would love a PDF of instructions!! Sharon, let me see if I can put something together. It was more of a measure and go type of project, but I will put together some details that might help!